RICHLAND — As the campaign season continues to ramp up, there is one voice we haven’t heard much: Sarah Palin. But she was the “talk of the town” Wednesday night in Richland. Palin’s father and brother are authors of a new book about the Sarah they know. 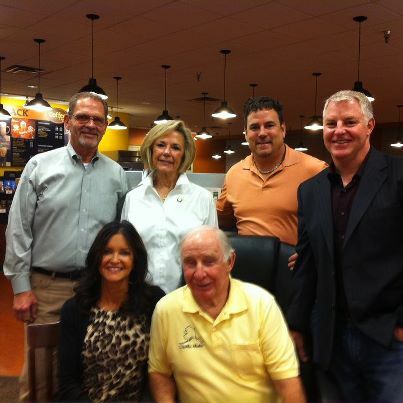 The two held a signing event at the Richland Hasting’s. Father, Chuck Heath, and brother, Chuck Heath, Jr. have been working for the last year, collecting their personal stories and documenting Sarah’s life and the Alaska experiences they say shaped the women she became. The father and son duo also say some of the stories in their personal account highlight a Tri Cities connection. And with family, friends, and fans by their side, those memories continue. The book hit shelves two weeks ago. It’s foreword was written by Sarah Palin herself. The former Alaska governor admitted she does not reminisce about her own debate with Vice President Joe Biden four years ago. “I’ve never seen clips of the debate. I’ve never watched any of those reruns from four years ago, from the acceptance speech to the debate or anything. No, life goes on. You move forward, and I don’t rehash the past,” Palin said. Palin said her debate prep was intense, with aides handing her stacks of cards filled with information about running mate John McCain’s voting record. 2008 — Perhaps the most anticipated debate in political history, certainly among vice presidential contests. The fascination with the suddenly famous Sarah Palin — going up against veteran Biden — drew some 70 million television viewers, the largest audience ever for a vice presidential debate. “Can I call you Joe?” asked the first-term Alaska governor during the opening handshake. But there is nothing like seeing the Palin/Biden debate for oneself. Here is the full Palin/Biden debate as shown on CSPAN1. The transcript of the 2008 vice presidential debate can be found here. Chuck Heath, Sr. and Chuck, Jr. encountered family and friends at many of the Our Sarah book tour locations, and every where they went they made others feel like family and friends. Now, this adventure in the Lower 48 has come to an end. They have had the experience of a lifetime, and we have certainly enjoyed vicariously accompanying them on every stop. After a schedule that took them to a plethora of states, the last of which was Washington State, the Heaths are headed back to the great state of Alaska. I miss them already. This is a picture from our signing tonight. These are some of our relatives that showed up: Greg and Brandi Jones, Kate and Tom Johnson… not pictured are my Uncle Ron and Aunt Colleen Jones. We also had friends show up from as far away as our old hometown of Skagway, Alaska (thanks Fred and Kathy Hosford). This is a bittersweet post for us. We just finished our final book signing in the Lower 48, here in Richland, Washington. Dad and I are physically and mentally exhausted from three weeks on the road. We’ve crossed the country, met some incredible people, done over fifty interviews, and along the way, we’ve become closer as father and son than ever before (even though there have definitely been times when we wanted to strangle each other). After all of our adventures, a big part of us doesn’t want it to end. We still want to get out to other places to share our adventures in Alaska and our time with Sarah, but we have families that we miss very much waiting patiently for us at home. We’re not completely done, though. We will be returning to Alaska late tomorrow night, and then we’ll head out to Wasilla, Friday, to do another interview with Fox and Friends (from Sarah’s little studio) at 3:00am! If you watch it Saturday morning, I’ll be the guy with the dark bags under my eyes and dad will be the guy mumbling incoherently beside me. Just joking dad… sort of. Today was a very busy day for us. Besides the book signing in Richland, we also did three radio and two television interviews. They all seemed to go well, but you never know how they’ll come across. We also had dinner with my uncle, Ron Jones, his wife, Colleen, and his son Greg and wife Brandi. As usual, our time with family was too short. I just want you guys that are following us to know how much we appreciate you. Your comments gave us the fuel we needed to keep going when we were bone-tired. My favorite part has been hearing from people at the book signings that have actually read the book and told me how much they enjoyed it. That’s so nice to hear. I know that dad and I are not a couple of Tolstoys, and we didn’t pretend to try to be like that when we wrote the book. We wanted to tell our stories in the same way we relate them orally to our friends. We’ll keep plugging along and we’ll try to get our book in people’s hands, despite getting little or no help from the mainstream media. Besides the stories about Alaska and Sarah, everyone should hear the stories about the way the media can try to destroy a good person’s character. Thank you again for all your support, and at the request of a lot of you out there, we’ll keep posting entries from Alaska, just not as many.